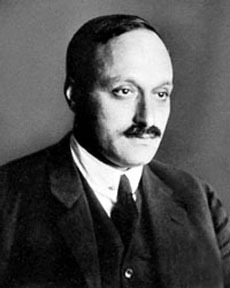 German-American physicist James Franck spent his career exploring the interaction of light with matter, with major research into photosynthesis in green plants and the behavior of atoms. With his colleague and collaborator, Gustav Hertz, he was awarded the Nobel Prize for Physics in 1925, for their description of laws governing what happens when electrons bombard the atom. Their best-known experiment, which is referred to as the Franck-Hertz Experiment of 1914, measured the kinetic energy lost by electrons in inelastic collisions with atoms, and showed the existence of excited states in mercury atoms. This provided the first experimental evidence to support the existence of stationary energy states and other aspects of Niels Bohr's atomic theory. Also in 1925, Franck proposed what is now called the Franck-Condon principle, which states that that in any molecular system the transition from one energy state to another is so rapid that the nuclei of the atoms involved can be considered to be stationary during the transition. While serving in the German Army during World War I he was awarded the Iron Cross for heroism, on two occasions. His WWI military service made him immune to the Nazi regime's racial purity laws banning Jews from public employment, yet he publicly protested the passage of these laws and, in 1933, quit his post at the University of Göttingen and fled Germany. After spending a year working with Bohr at Copenhagen, Franck came to America, where he became a citizen and worked on the Manhattan Project to develop atomic weapons. In 1945, with Leo Szilard and numerous other scientists, he co-authored what is now called the "Franck Report" to the War Department in 1945, urging his adopted nation to demonstrate its new weapon at some uninhabited location as a incentive to compel Japan's surrender, instead of dropping these new bombs on Japanese cities. The report, famously ignored, also warned that use of atomic weapons could trigger an arms race that could cause wasteful military spending in numerous nations, and lead to dangerous confrontations between atomic-armed nation-states. When Franck fled Germany he left his Nobel Prize locked in a safe. To keep the medal (made of gold) from being seized, melted and sold to support the German effort during World War II, Franck's colleague George de Hevesy had the Nobel Prizes of Franck and Bohr reduced to powder and stored without a label. After the war, the dust that had been Franck and Bohr's Nobel Prizes was shipped to the Nobel Foundation in Sweden to be recast, and in 1951 the Nobels were re-presented to both men, who were close friends.